EB is offering foreign muaythai fighters based in Thailand the opportunity to join the Sor Kaeswsuek and NTG teams led by Ajarn Gae and Ajarn Nugget at the EB Fight Club Gym in Bangkok. 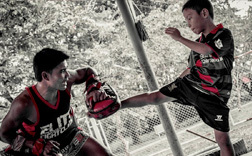 Over the last few years, both trainers have established themselves as two of the top coaches on the muaythai circuit by successfully training and developing a number of leading muaythai fighters. In addition to training the Thailand VS Challenger teams, the main aim of the EB Fight Club gyms is to identify and develop the best young talent from around the world in order to produce world-class fighters to compete in Elite Boxing’s own events. 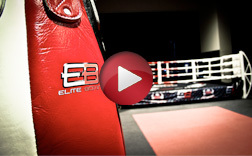 Each EB Fight Club is divided into teams of fighters led by the facility’s head trainers. As well as being the first gym opened by Elite Boxing, EB Fight Club Bangkok is also the headquarters of the EB Fight Club subsidiary. Located in the heart of the affluent Thong Lor and Phrom Phong area of downtown Bangkok, EB Fight Club Bangkok is a first-class training facility that includes the latest training equipment as well as a swimming pool and sauna. Members of the Thailand VS Challenger team regularly train here, while the resident trainers also have their own teams of fighters who are being developed to compete in EB events. Elite Fight Club (EFC) Phuket is the latest addition to the EFC network of premium quality gyms that includes training facilities in Bangkok and Germany. Previously the Manop Gym, EFC Phuket is located close to the beach in the picturesque Chalong Bay are of Phuket and was acquired by EB in April 2014. As a popular holiday destination, Phuket attracts a high volume of tourists looking to combine a tropical island holiday with muaythai training. A large number of gyms have been established on the island as a result. Despite the intense competition, the Manop Gym has achieved a reasonable degree of success since its launch in 2012. Backed by Brazilian financing and managed by Max Castro, the gym has catered to a mixture of semi-professional Brazilian fighters and tourists from around the world.